Percutaneous Coronary Intervention (PCI) for coronary artery disease has seen rapid and significant technological advances since its introduction, in the last 30 years. The technique has been adopted worldwide and now is the commonest modality of revascularization, with increasing numbers of patients being treated every year. In Malaysia, PCI has taken a great stride forward in the last 20 years. It was performed at various setups, including the National Heart Institute, Ministry of Health hospitals, university hospitals and also private hospitals. In recognition of the importance of this treatment modality in this country, it is timely for Malaysia to have its own registry. This report provides information on the establishment of PCI services in our country, patient characteristics, clinical presentations, lesions characteristics, procedural details with regards to device utilisation and outcomes. As the report comprehensively covers such vital information it will undoubtedly be used as a point of reference for policy makers in future planning and funding of cardiac care services. 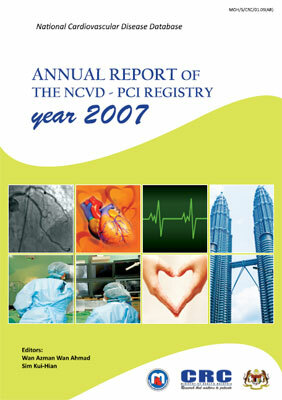 I would like to congratulate the National Cardiovascular Disease Database team for the production and publication of the inaugural PCI Registry report for year 2007. Together, I would like to commend the Clinical Research Centre, National Institute of Health, Malaysia and the National Heart Association of Malaysia for coordinating and supporting this registry. This is indeed an important endeavour in striving to provide state-of-the-art care for our ischaemic heart disease patients in this country. I wish you all the best and thank you for this fine effort.